– How The RNA Institute is using a unique RNA target to engineer a novel antibiotic. – The opportunities that small activating RNA can bring in drug development. – How to utilise RNA epigenetics, by targeting RNA modifying enzymes. – Drafting a successful new patent application for an RNA therapeutic. – The advances in targeted delivery of nucleotides beyond the liver. – Targeting liver hepatocytes using alternative delivery approaches with siRNA. – The important advantages of exosomes as an RNA delivery system, compared to other nanoparticulate systems. On Day 1: Examine topics on using RNA for therapeutic opportunities including treating cystic fibrosis, liver cancer and skin diseases, and examine the novel approaches and emerging technologies to support these treatments. Day 2: Explores commercial and regulatory considerations, whilst also examining the developments in delivery systems to direct the therapeutic to their target. 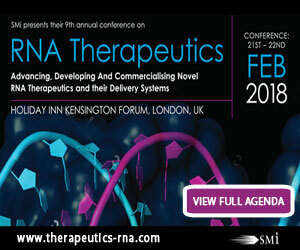 The Keynote Address on day 1 will be presented by Paul Agris, Founding Director & Professor at The RNA Institute. Gain a deeper insight into his presentation ‘Engineering a Novel Antibiotic Against a Unique RNA Target that Prevents Resistance’. His session will be looking at how novel antibiotics can bind to target RNA and prevent resistance with low cytotoxicity and toxicity. The Opening Address on day 2 will be presented by Kirsty Wydenbach, Senior Medical Assessor, Deputy Unit Manager, Clinical Trials Unit, at MHRA. Her presentation ‘Gaining Regulatory Approval and Mitigating Risks during Clinical Trials’ will explore how best to gain regulatory approval and clinical success through overcoming common governing pitfalls and understanding the expectations of regulators.